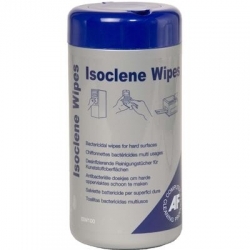 Ready to use bactericidal wipes for disinfecting most hard surfaces. Kills 99.7% of bacteria found on office equipment. Great for Keyboards and mice and work desk area. For best result, pre-clean the surface. Available in a resealable tub to retain freshness. Warranty: 30 Day Return To Base Warranty.